Hey friends! Whats up? You might be getting troubled by Cydia because of its packages. Most common being Cydia not loading packages, Cydia packages not working. Don't worry friends here I am sharing this post with you where I will answer questions related to problems with Cydia packages or say Cydia sources. Cydia is a well known third party app that you can download on your iOS device to install cracked apps, themes, lockscreen tweaks, download Facebook videos, wallpapers and IPA files. Cydia usually gets updated to be compatible with different versions of iOS on iPhone, iPad and iPod touch. 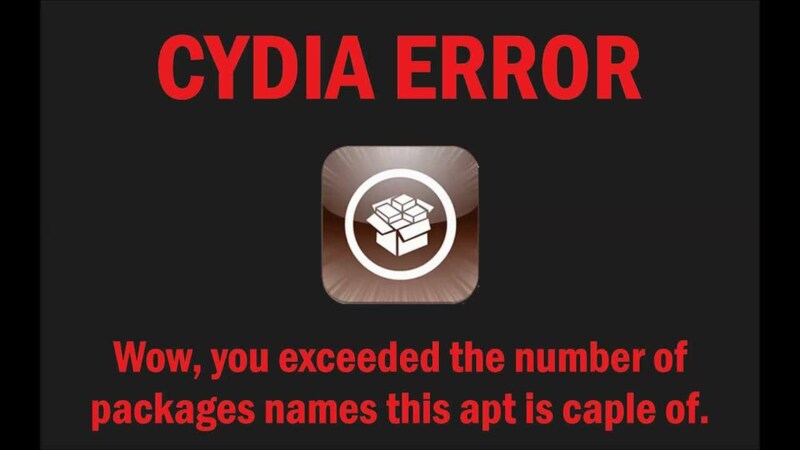 Cydia is maintained regularly and seldom gets any complain from its users. But now with the changing form of latest versions of iOS it becomes necessary to update Cydia more frequently. And due to this updates you might face a few problems sometimes and Cydia packages not show up. Many times when you open Cydia and try to add sources but it shows error messages such as, "Cydia Sources Not Working" or "Wow, you exceeded the number of package names this APT is capable of" and "The package lists or status file could not be parsed or opened". Here are solutions to some of these issues. Issue I - "Wow, you exceeded the number of package names this APT is capable of"
Sometimes it also gives the message "Wow, you exceeded the number of package names this APT is capable of". Solution I - Open Cydia and delete all the added sources. For this go to var/lib/apt/lists and delete any sources that aren't the ones that come in Cydia already. Also delete the release and package files. Then go to etc/apt/source.list.d and open cydia.list and delete sources from there. Now respring your iOS device. Cydia should start instantly. After following the above steps respring. This should definitely fix the issue. Basically this problem arises when you have added excess of packages. Cydia allows adding of 65,535 packages out of which 40,000 packages are installed from the start itself. And once you have added rest it becomes full and starts showing error. Use the above solution and try not to add useless sources. Try this list of best Cydia sources for iOS. Issue II - "Failed To Fetch HTTP/ 1.1 404 NOT Found"
Issue II - This is another issues that arises. Cydia packages are not loading. You keep trying to add a source or repository to Cydia using the "Add Cydia/ APT URL" option but it always shows error message as "Failed to fetch HTTP/1.1 404 Not Found". Solution - This happens because the Cydia source you are trying to add is getting updated or is currently offline. You can't do anything in this except to wait. You can try to add another repository that serves the same purpose. It will get added instantly if its online. But if the repository is offline then you have to wait for sometime. It could be a few minutes, few hours or even a day. Also See - How to add "repo666.ultrasn0w.com" repo to Cydia. Issue III - This is a very complicated problem. But with a very simple solution. Many times you will open Cydia and will see nothing. Cydia packages not loading, sources are gone. 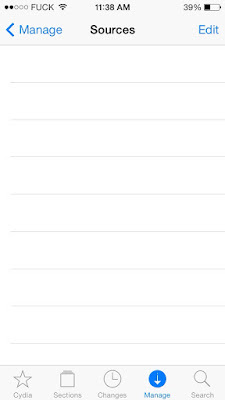 Though it looks very clean and tidy but keeping it this way will affect the utility of Cydia. So we will follow some steps to bring the repositories back. Solution - First check if you have recently updated your iOS and what were your means. Whether you have got iOS upgrade by an OTA or by physically connecting to iTunes. If you used OTA then you need to start over again. If you haven't upgraded your iOS and problem arises then this problem is occurring when one or more of the repositories are not working properly. To solve this just delete the Cydia repository that you think is creating problem. If that doesn't work as well then you will have to reinstall Cydia and things will be fixed. Also see - Pandora downloader Cydia not working. These were some problems of Cydia not loading packages, Cydia packages not working. So if Cydia packages are not showing up in your iPhone, iPad or iPod touch do check out the above solution if they help you. Else do comment and we will try to figure out something else.